Research shows a link between UV radiation and an increased THC content of marijuana. With this knowledge, we can increase our crop’s potency. Find out how to use UV light to produce potent weed! 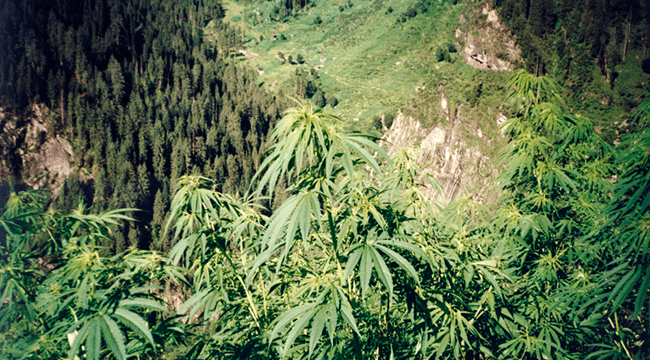 We know that the most potent weed that grows naturally can be found in elevated mountainous areas around the world. Worthy to mention here, would be the growing hashish production areas in the Rif Mountains of Morocco, the Beqaa Valley of Lebanon, and the Hindu Kush. These areas have several noteworthy things in common: they are all close to the 30 °N latitude on the globe, they have the perfect marijuana-growing climate, an abundance of sunshine, and most importantly, they are located at high altitude. This means that plants receive substantially higher amounts of UV radiation – they higher you go, the greater the exposure. UVB is a part of the sun's natural light, so all outdoors plants get it to some degree. Small and affordable UVB-emitting "reptile lights" can often be found in pet stores, as some reptiles need UV light. You can also do an internet search for those types of supplemental UV lamps. Some newer grow lights may even come with an integrated UV light. For the average micro or mini grow-op, those supplemental UV lights don’t have to be large. A single reptile light (or “desert light” as they are sometimes called) can be sufficient if you want to supplement some UV light to boost your crops’ THC content. Outdoors, there is little you can do to boost UV, other than grow up a mountain! Either way, the fact that UV could play an important role is an interesting discovery, showing just how much we still have to learn about this wondrous plant!